UPPER WEST SIDE — He's a real bookworm. 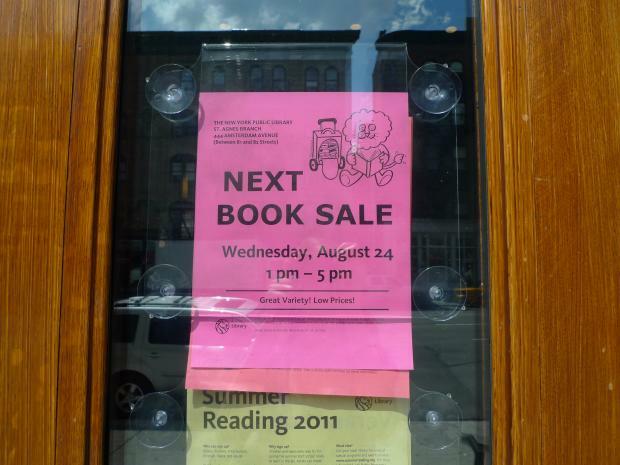 A clerk at an Upper West Side public library branch allegedly pocketed more than $46,000 from book sale fundraisers for the cash-strapped system, according to police. Adolfo Marrero, 41, an employee at the St. Agnes branch of New York Public Library at 444 Amsterdam Ave., near 81st Street, was arrested on Aug. 2 for allegedly pilfering money from 18 book sales between October 2010 and June 2011, according to a criminal complaint. He was charged with one count of grand larceny and released without bail. The union employee has been suspended without pay pending a disciplinary hearing, said NYPL spokeswoman Angela Montefinise. Marrero's attorney declined to comment. The library holds the volunteer-run book sales in its basement as a way to raise cash for the budget-crunched institution. Used books from the library's collection, as well as donated books, are sold for as little as 50 cents, with prices topping out at about $5. But the library needs every penny — the NYPL recently announced budget cuts could mean the closure of some branches and slashed hours. After each book sale, Marrero was responsible for collecting cash from the register, recording the amount in a ledger and then depositing the money at the bank, according to the criminal complaint. However, some of the cash under Marrero's control allegedly didn't make it to the bank, the complaint said. At all 18 of the sales, Marrero allegedly wrote down one amount in the ledger and deposited a lesser amount in the bank, pocketing the difference and eventually collecting $46,843.70. A library employee who oversees proceeds from the book sales noticed the discrepancy and tipped off authorities about the suspected embezzlement.